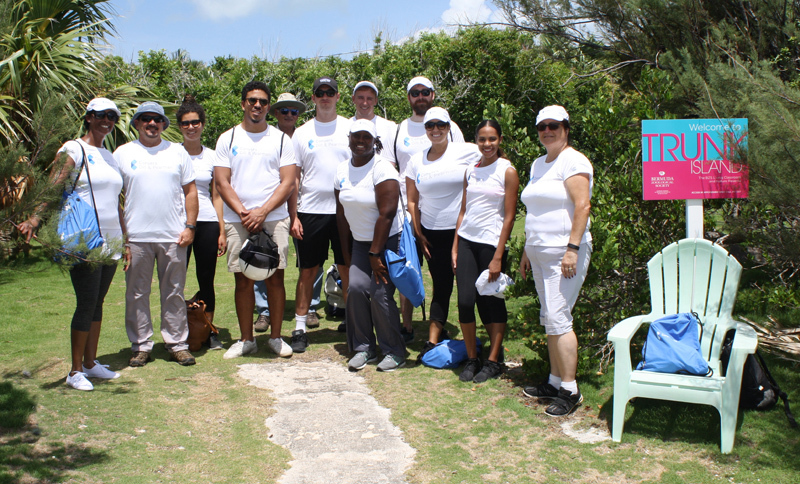 Conyers Dill & Pearman teamed up with the Bermuda Zoological Society [BZS] for the first of two Volunteer Days. Conyers’ summer law programme students and mentors were involved in a restoration effort as part of the Trunk Island Conservation Project, which is a seven-acre island in Harrington Sound that serves as the BZS’s “Living Classroom”. Conservation efforts to date have included maintaining one of the last remaining Palmetto Palm forests in Bermuda and eradicating invasive plants such as the Casuarina, Brazilian pepper and Chinese fan palm. This allows the team to start reforestation with endemic cedar trees. Trunk Island has the potential to become a habitat for rare endemic species, making it closer to its realisation of becoming a “Living Classroom”. The Volunteer Day was led by Captain Trevor Rawson, a conservationist working on Trunk Island. Captain Rawson guided volunteers as they cleared paths and created a “Bio-Fence” by planting native cacti to strengthen one of the Island’s cliff faces from natural erosion. Commenting on the Volunteer Day, Lisa Spencer-Arscott, Head of Human Resources at Conyers said, “As a Firm, we feel strongly about making contributions that improve the well-being and environmental protection of our communities. The efforts carried out during our Volunteer Day at Trunk Island are a testament to this”. Conyers 2016 Legal Scholarship recipient and current student, Mariangela Bucci, who is working in the Corporate department of Conyers, said, “The summer law student programme provides valuable experience to students and the opportunity to apply academic skills in a real-world setting, Volunteer Days further cement the ideals and values of the Firm in giving back to the local community”. This is the first of two Volunteer Days that Conyers is organising, as part of its summer law student programme, which has two rotations of student interns over the course of six weeks.